Blue skies and sunshine. Maybe - hopefully - spring is finally here. This is part of a footbridge that spans the coastal path running from the point of Cap Martin to Monaco. It's called Promenade le Corbusier. 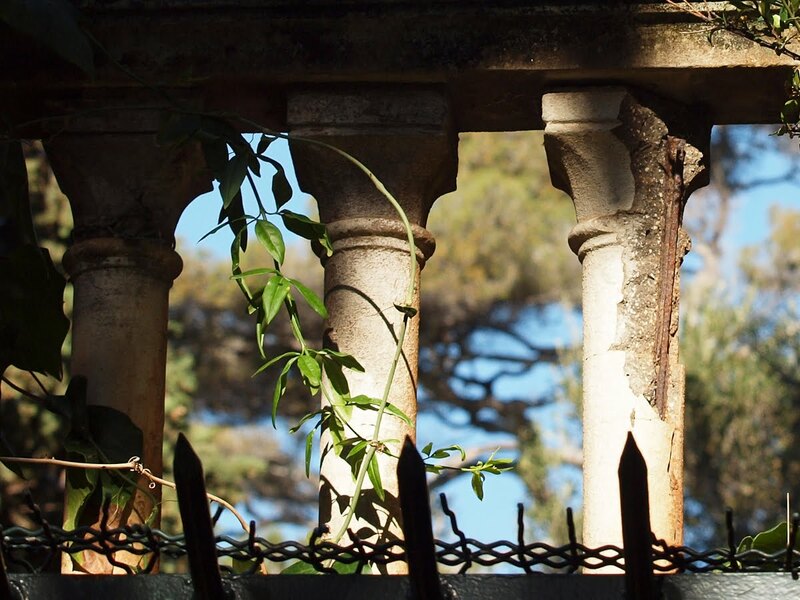 The footbridge leads from the gardens of Cypris, one of Cap Martin's beautiful villas, to a long arched gallery, a kind of cloister on stilts. We'll see that another day. Un ciel bleu et du soleil. Peut-être - je l'espère - que le printemps est enfin là. sorte de cloître sur pilotis. Nous allons voir ça un autre jour. I also like taking photos of columns! Have a great weekend, Jilly! I was expecting a modernist light glass/steel structure. I don't think Le Corbusier would appove of repo classic balstraude with concrete cancer. Love the play of light and shadow.. nicely done! You have some amazing collections. Great pictures! A nice shot. Nasty spalling of the concrete column. I am surprised to see something so traditional associated with LeCorbusier. I need to explain. This bridge has nothing to do with Le Corbusier. There is a beach path that runs from the point of Cap Martin to Monaco and this path is called Promenande Le Corbusier as the architect built his famous cabanon here and also drowned in the sea off the rocks one day. It's named in his honour. This bridge is part of a house called Cypris that spans the path - it has nothing to do with Le Corbusier himself and was there long before he came to live here. Thanks for the explanation about the name. These pilars certainly don't look like they have anything to do with Le Corbusier style. Great work on light here. You came dangerously close to over exposure on the third pilar to the right but the photo is so interesting I'm really glad you took it and showed it! I have walked that walk with my wife two or three times. I adore that coast. And Menton, which that monster from a factory town near Boston (he will never get over notbeing born a prince) Paul Theroux, thinks is the backside of France. When I walk along the seaside at Laguna Beach and look south, I think of Menton and that great view toward Vingtimilia and the Italian coast. Glorious. During a nasta storm that blew in and out in moments, lightning struck and sparked that fence which my wife had just released. A primitive moment in a favorite place. Richard, I agree. This walk is one of my favourite along the whole coast.